I am currently without health insurance. Very recently, I was experiencing some serious pain in my right Achilles tendon whenever I went out running. The pain started weeks ago, and gradually got worse over time. It got so bad that I had to stop running, and a developed a slight limp. Being without insurance, I tried my best to see if I could fix this problem on my own. I visited webpage after webpage, from high profile sites like WebMD to small forums dedicated to running. I found all kinds of advice, but one recommendation stuck out as the best place for me to start. I found a forum where a doctor recommended to someone with the same symptoms (Achilles Tendonitis) to change his running shoes right away. So, reluctantly, I went to my local mall to shop around for a pair of running shoes. This was not easy for me, as I go shopping for clothes and shoes once every 5 to 7 years. Moreover, I already had a perfectly fine pair of running sneaks at home. I tried on countless shoes, but most were made for people who have an arch in their feet so they weren't any good for my extremely flat feet. 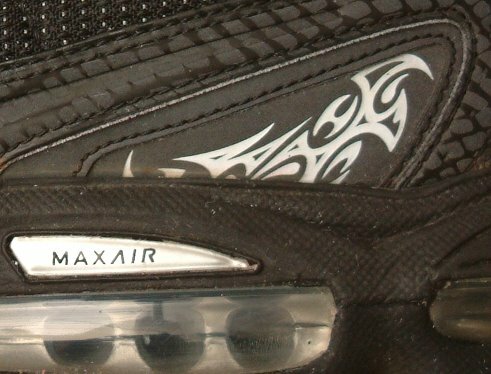 Eventually, I found a pair of Nike MAXAIR running shoes that were perfect: light, comfy and not even a hint of an arch. They cost $125 plus tax, a price that actually made me sweat a little, but I bought them. The salesman assured me that I could return them if they did not work out. So, after giving my tendon a few days rest, I was back to running in my new kicks. The pain subsided after a few runs and is now completely gone. I had no problem running with the diminishing pain, as, for me, it's even more painful to be without exercise. I simply don't function right without it. Keeps my body fit and strong and my mind sharp and resilient. I used to tap into my "internal pharmacy" by biking a lot, but I had to give that up completely after I developed a pinched nerve in my neck. Though I love cycling, it doesn't suit my body type at all. And yes: I've tried lots of different bikes. Eventually, I'll give a recumbent bicycle another try, but for now, I'm sticking with the running. Many years ago, when I was a teenager in boarding school, my physical education teacher used to tell me that my running style is no good. When I run, I naturally lean forward, and with each step I land on the balls of my feet. For long distance runs, my gym teacher -- we'll call him Mr. WW -- used to try to get me (and others) to run more upright, which would cause me to land on my heels. I resisted his advise, because I never really trusted him, and his advise just didn't seem to make sense to me. He was from an era when runners would run very upright, and lifting the knees as high into the air as possible was considered good form. Turns out I was right to trust my instincts. A few months ago, I caught an excellent broadcast of Radio Times on NPR about running. Marty Moss-Coane interviewed Christopher McDougall, author of the book Born to Run. McDougall spent time with the Tarahumara Indians of Mexico’s treacherous Copper Canyons, a group with some astounding runners. These natural runners are able to do 100-mile ultramarathons barefoot by running exactly the way I run naturally: leaning forward and landing on the balls of their feet. Of course, these folks run at an easy pace, but I think most would agree that 100 miles is amazing at any pace. For more on Born to Run, visit this link. To listen to the Radio Times interview with Christopher McDougall, visit this link (mp3.) Highly recommended! They are cool! not to expensive! > They are cool! not to expensive! Heh...Thanks. They are cool. I've been very happy with them. I have to keep my toenails clipped very short all the time but that a small price to pay for running comfort. $125 is WAY beyond what I wanted to pay, but nothing else was working so I had no choice. But they are fine! Just not good for my feet. They are Nike all-terrain sneaks, and it turns out that, for long distance runs, they are just too heavy and inflexible for my feet. They'd probably be just fine for someone with stronger tendons than mine. I'm just so glad I've got my running back, and without a doctor's bill.